I’ve been thinking this week about what I want to DIY next! I haven’t really made anything since we moved and I’m starting to get antsy! So I thought I’d take a look at some of the pins I’ve pinned and see what I can come up with! 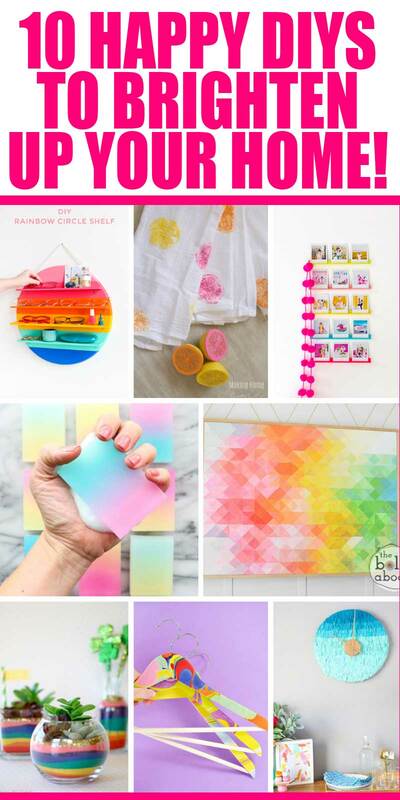 Here are 10 awesome, happy DIY’s that you can make to brighten up your home. It is almost spring despite what the chilly temps might be tellin’ you! I’ve included a couple of my own projects just to remind myself that I can do fun, happy creative things! These are all pins below so you can go directly to Pinterest and pin them for yourself! I hope you enjoyed these fun, happy DIYs! It’s so inspiring to see all the colorful, uplifting things creatives make, isn’t it? What”s your favorite? Pop over to this post on FB and let me know in the comments!